It it surprisingly simple to build your own rock garden – give it a try! I have always loved rock gardens. Not because I knew that they are a great addition to any landscaping, or because they can really add to colour and structure, but mainly because my grandpa built great rock gardens in the house I was born in. He constantly worked in the garden – as soon as the last frost showed up, so did my grandpa. Sometimes there were still patches of snow and he would be out there with rake, cleaning up whatever he could. 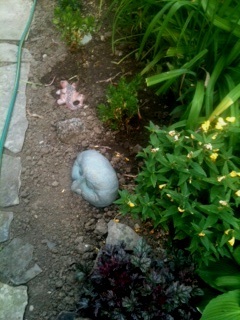 From him I learned that building a rock garden is surprisingly simple. And that if you are not happy with what you are seing – just change it. Personally, I am now on building my third rock garden. 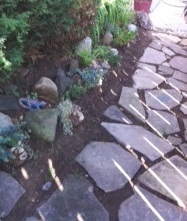 With changing the landscape in our garden, plus using plants that grew way too much – I now decided to build a rock garden alongside a walkway to our backyard. It seams like a great way to make an interesting border – so we will see what happens. 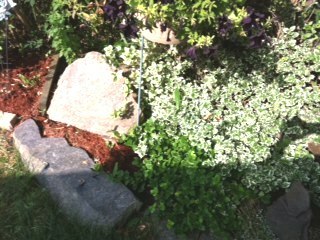 The area I am talking about is a natural slope – and that is a great place to put a rock garden. It also gets good sun – about half the day, from early morning to noon. If you don’t have a naturally sloping spot to build your rock garden, that is not a problem. There are a number of ways you can still do it. Building a raised bed or a natural mount called berm are couple of options. All you have to do is to remember that most rock garden plants need sun and good drainage. To build a berm, start with a pile of rocks, covered by a layer of sand – that will ensure good drainage and the sand will keep the topsoil in place. 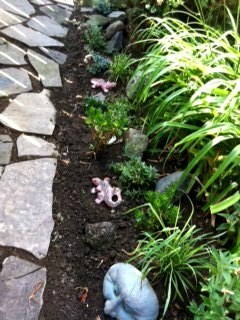 Cover your berm with a good layer of top soil and you are ready to start being creative. Start with collecting rocks – you can search through your area or purchase them at various landscaping outlets. Make sure that you dig the parger ones about one third into the ground – that will make them look more natural. We brought these rocks from Northern Ontario years ago – great place to pick up awesome rocks! 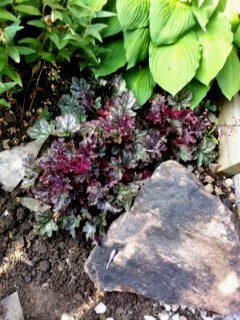 Select your plants: I went to a garden centre and picked what I thought would be suitable and look nice in my rock garden. I had a specific purpose in mind – I wanted to get really creative and include faces and other artsy elements in my rock garden. Youc an see from the picutres what I mean. Most of the items came from a dollar store and couple of them I found at garage sales. All I did is pictured what a particular piece would look like in my rock garden and pretty soon I had a theme going. I found these little pots in a local dollar store, buried them about halfway into the ground on a slight angle and planted plants into the ground just above them. That way I can take the pots out and store them for the winter. I have taken these pictures a week ago and have since added other plants and few more rocks I found where I had my “old” rock garden. I am not at all owrried whether or not all the plant I put in will do well – I am just going to watch them and those that are not exhibiting joy at being where they are will be moved. I found this gem of a face in a garage sale – paid 50c for it and I love it. This is what it looked like last week…. 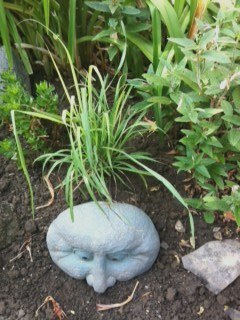 This is a picture I took this morning – I planted lemon grass above my favourite face. We will see if it does well – if not – it will just get moved and another plant will be given a try! Hope you start building your own rock garden soon and I would love to hear your comments, suggestions and experiences – even more – I would love to see your pictures! Here are fedw more picutres from my rock garden building developments. Am I having fun? you bet! 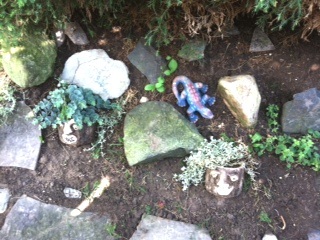 I also found colourful little lizards in the dollar store – they will be stored away for the winter, but for now, they add a nice colour and fill the spaces between rocks instead of just all plants. My rock garden is bordered by lilies, small cedar hedge and grape wine on the house side and a slate walkway on the other. Natural way to fill in a space where I wasn’t sure what to grow. 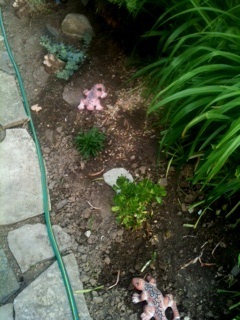 This is the very start edge of my rock garden. I worked with plants that were already there – added some interesting rocks and so far, I am loving it! Growing things is most definitely a rewarding thing to do – and it really doesn’t matter where you live, whether you have acres and acres of land of a little balcony in an apartment. Having something green, alive and flowering is always awesome! Hello Michelle! Thanks so much for your kind words and I would love to see what you will create! Please stay in touch and if there is anything I could be helpful with, just let me know!